Jumio, today unveiled a new technology that called Netswipe, it utilizes any webcam as a credit card reader to offer consumers a quick and easy way to make purchases online. Netswipe is the first and only solution that enables online card-present-transactions: Checking out just like at the point of sale (POS). To complete a transaction, consumers briefly hold their credit card in front of their webcam. 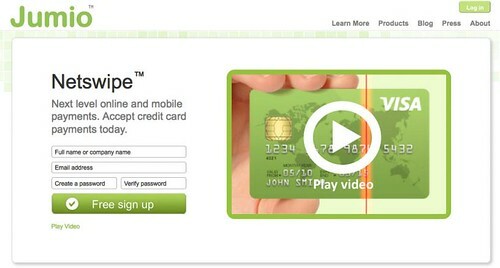 Through secure video streaming, the credit card details are being recognized and verified. No snapshot image is being taken, no data is stored on the computer that is used for the payment. With the launch, Jumio has introduced three products for merchants that simplify the online payment process: Netswipe Start, Netswipe Scanning and Netswipe Processing. Additional products including a mobile solution will be released later this year.